1920 Triton Delight; 1600 Bristol Surprise; 1520 Cambridge Surprise; 61 com; atw. Last updated Saturday, 26 January 2019 at 17:11:39. First submitted Saturday, 26 January 2019 at 17:09:34 by George M Salter. 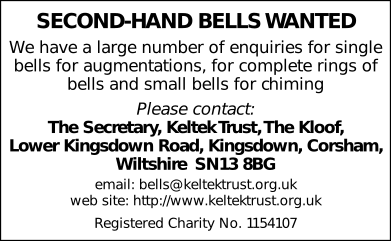 Sent for publication in The Ringing World on Tuesday, 29 January 2019 at 23:46:23, and printed in issue 5625, page 158. This performance has been viewed 1643 times.